More than one in eight patients rushed to hospital in an ambulance this winter has faced a delay of more than 30 minutes on arrival, BBC analysis shows. Patients are meant to be handed over to staff within 15 minutes, but more than 75,000 have waited at least twice as long as that in England. Some of the worst waits had lasted up to five hours, ambulance crews said. 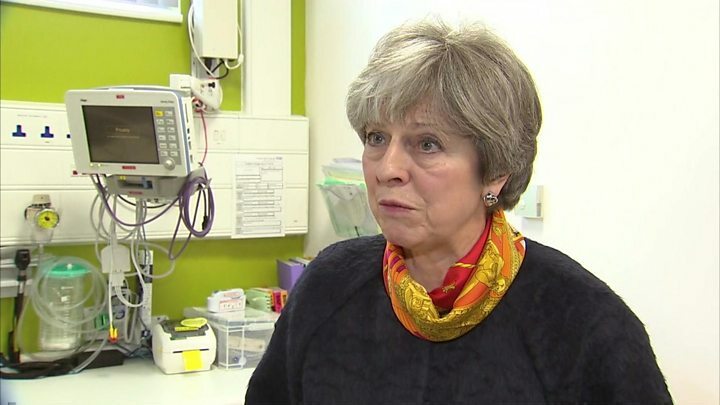 Doctors warned the delays put patients at risk, as the prime minister apologised for problems in the NHS. Leah Butler-Smith was with her mother, who she thought was having a stroke, when she was caught in a queue outside Broomfield Hospital in Essex this week. "We weren't moving. We weren't going anywhere," she said. Her mother kept falling in and out of consciousness, while she and her sister tried to keep her spirits up. Ambulances continued arriving, making them scared they would be bumped for more urgent cases. "It's just gobsmacking," Leah said. She said it was too soon to know what affect the delay had had on her mother's health. "The staff are doing all they can. There just aren't the funds for the beds," she said. Dr Ellen Makings, medical director at Mid Essex Services NHS Trust, said she was "extremely sorry" for the waits experienced on that day. "Our staff were working extremely hard to ensure that all patients were safe at all times. "Whilst it was far from ideal for this patient to have an extended stay in the ambulance she was cared for throughout by experienced paramedics and was assessed by a qualified emergency department sister within 30 minutes of arrival, and then again by an emergency department consultant at one hour 50 minutes." She added once Leah's mother had been assessed and had a scan it emerged she had not had a stroke. Instead she was diagnosed with a stroke mimic, where a patient presents with stroke-like symptoms but has not actually had one. Dr Taj Hassan, president of the Royal College of Emergency Medicine, said the problems being seen were "not surprising". "A&E units are over-crowded, so staff just cannot take care of these patients and ambulance crews have to stay with them. "It means they face longer delays for all the assessments they should get. It is a risk, but there is nothing we can do about it." Figures from Public Health England show there was a sharp rise in hospital admissions in England for confirmed flu cases in the last week of December, and PHE bosses said this was contributing to pressure on the NHS. The analysis of handover delays by the BBC is based on official NHS figures for 20 November to 31 December. They happen when A&E staff are not available to take care of patients brought in. Some have to wait in the back of ambulances, although many end up in waiting areas and side rooms until nurses and doctors become available. 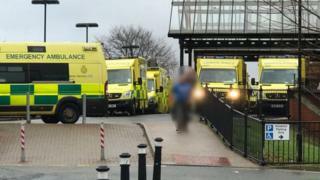 Ged Blezard, director of operations of the North West Ambulance Service, said the delays were causing a "number of problems" and compromising the safety of patients. "We are nursing patients in hospital corridors - and that is affecting our ability to respond to patients in the community. It is happening on a daily basis," he added. He said there were sometimes between 12 and 15 ambulances queuing outside A&E units, with some of the delays lasting four or five hours. Patients caught up in the problems said they feared for their health during the waits. Labour shadow health secretary Jonathan Ashworth said the figures showed the "shocking scale of the crisis in the NHS" and ministers should be ashamed that patients had been "left languishing" like this. Prime Minister Theresa May has apologised for the problems being seen. This week NHS bosses announced the cancellation of tens of thousands of non-urgent operations in an attempt to ease the pressure on hospitals. Mrs May said: "I know it's difficult, I know it's frustrating, I know it's disappointing for people, and I apologise." Saffron Cordery, of NHS Providers, which represents hospital managers, said the problems showed the "strain" the system was under. "Despite planning more meticulously than ever before, the level of demand for services means severe pressures remain," she said. Problems have also been reported in other parts of the UK. The Welsh government said the health service was facing "significant pressure" and the chief executive of the NHS in Wales apologised to patients whose operations had been postponed. Meanwhile, in Scotland there has been a 20% jump in A&E attendances compared with the previous year, prompting an increase in patients waiting more than four hours, and in Northern Ireland the Antrim Area Hospital has had to bring in St John Ambulance volunteers to help with a surge in demand. Correction 14 January 2018: This article has been amended after the Mid Essex Services NHS Trust provided a statement about the care given to Leah Butler-Smith's mother, pointing out when she was seen by an emergency department nurse and consultant. References to her not being seen by a doctor for five hours and having a stroke have been removed.